I’ll say it again, I don’t know where the time went! Let’s rewind and go back to the beginning of November. A few posts back, I was telling you that my husband and I were busy with birthday parties and marathon running. As I mentioned, my husband turned 40 and chose to celebrate with a small group of friends over a pig roast at The Breslin. 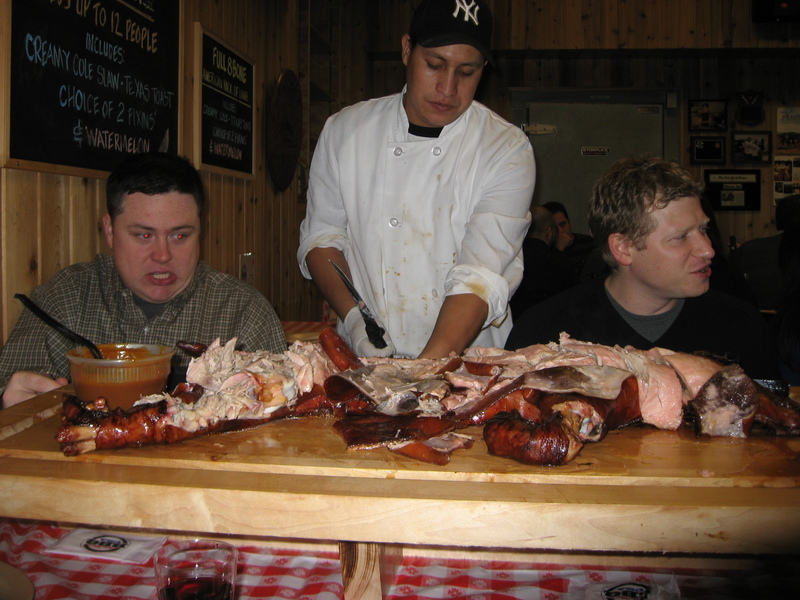 In the past we’ve organized a pig roast at Daisy May’s on 11th Avenue, which is exactly what you see below – a butchered pig while sitting on picnic tables and eating off of paper goods. The BBQ is VERY good and we’ve been back many times – particularly for the pork ribs and the creamed spinach. Daisy May’s BBQ has a Latin flare to it with the rice and beans sides. 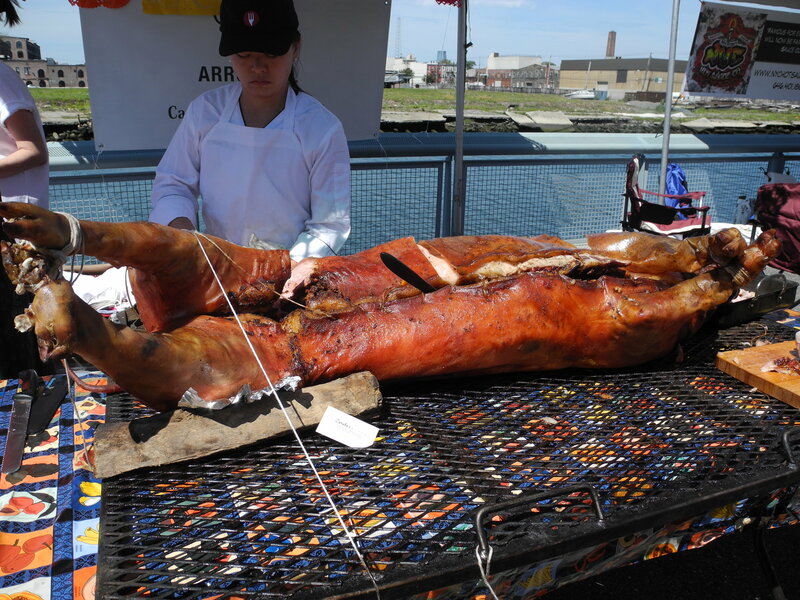 This past summer we attended Pig Island – a pig roast of sorts near the Ikea in Red Hook, Brooklyn, put on by Food Karma Projects. One ticket bought you a sample of pig used in all different ways created by 25 different chefs throughout the 5 boroughs and free 6 point beers. 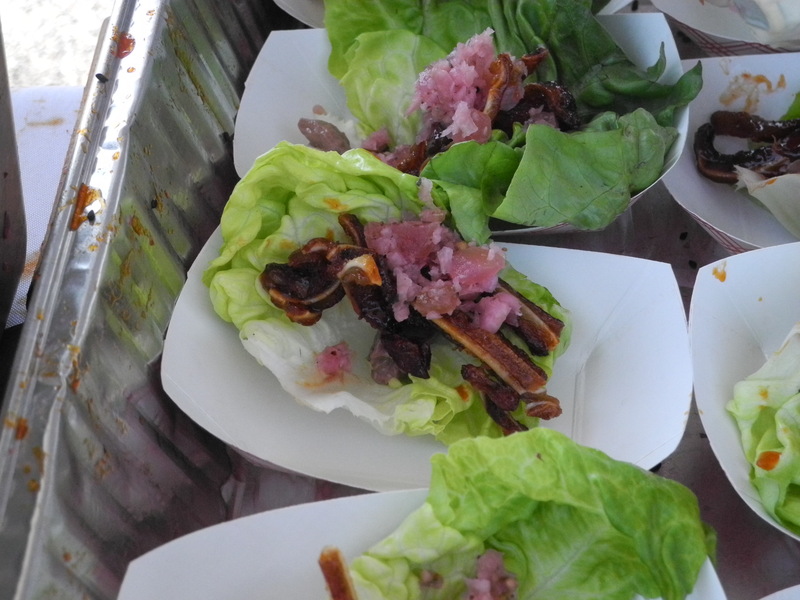 Pig Island wouldn’t be complete without the whole hog slicing …..
and 2 -the crispy pig ear lettuce wraps with pork pate and a fermented cabbage…. But back to the main focus of this post, we celebrated my husband’s 40th birthday at the Chef’s Table Whole Roasted Sucking Pig at The Breslin located in the Ace Hotel. I had never been to the Ace Hotel so of course, being that it’s a birthday party, my biggest worry was what to wear! It’s a pig roast in the Ace Hotel! The 2 ended up meeting somewhere in the middle. The lobby of the hotel has a bar and is designed as a casual living room to encourage conversation. The Breslin, adjacent to the lobby, is a casual yet upscale pub and the pig roast was as classy as a pig roast can get. 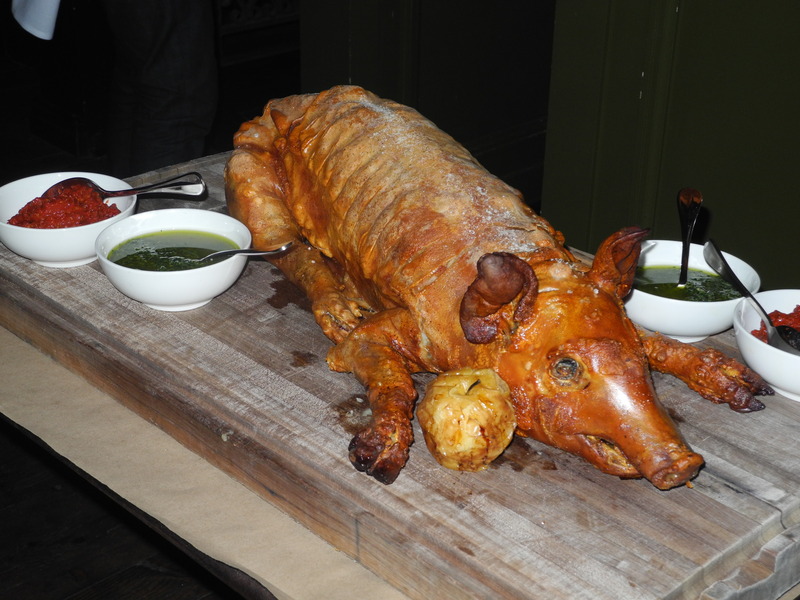 The presentation and the quality of the “pig roast” met all expectations of that of April Bloomfield and Ken Friedman. The pig was presented to us whole before it was delicately carved just as the restaurants do with whole fish. The pig was accompanied by most delicious sides that balanced out the meal just as Thanksgiving sides do with the turkey. Our party was a party of 8 and we had way more than any of us could. We enjoyed our leftovers for days. My husband was extremely happy with his 40th birthday dinner – very satisfied with the service and with the meal. Whether it’s for a drink or for a full meal, the Ace Hotel should be on your list. 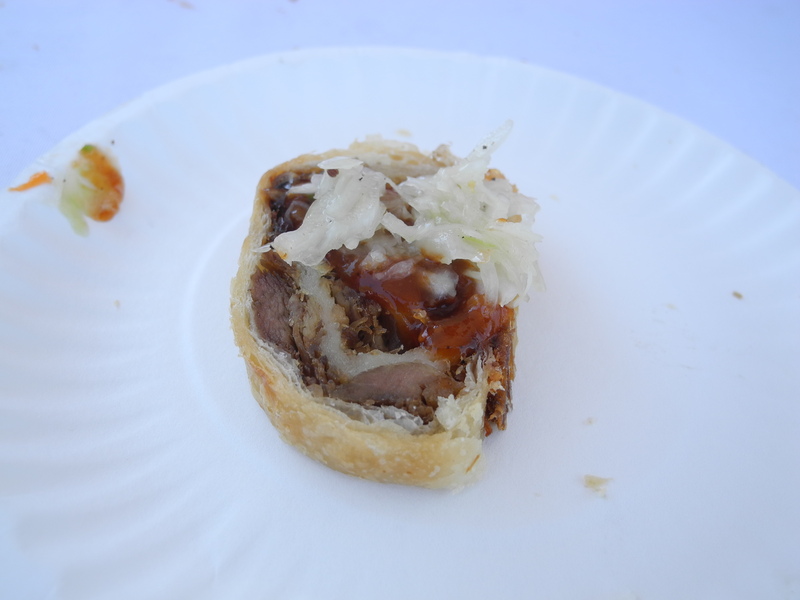 This entry was posted in hungry? and tagged BBQ, birthday, Daisy May's, Pig Roast, The Breslin. Bookmark the permalink.